Home > CarPro Iron X Soap Gel 500 ml. CarPro Iron X Soap Gel 500 ml. Clean deep down with Iron X Soap Gel! Iron X Soap Gel by CarPro removes corrosive iron particles from paint, glass, and alloy wheels to stop ongoing damage in its tracks! Iron X Soap Gel removes road grime and salt from the paint and leaves it slick and smooth. Iron X Soap Gel is pH-balanced and acid-free. Iron X Soap Gel removes what washing and claying can't! Airborne chemical compounds and ferrous (iron-containing) particles penetrate auto paint and create corrosive compounds that eat into the paint's sublayers. Detailing clay removes the particles but it doesn't remove their effects - corrosion may already be creeping under the paint's surface. Iron X Soap Gel removes ferrous particles with a rich foam. The only way to truly remove ferrous particles is with a dedicated iron remover like Iron X Soap Gel. Iron X Soap Gel opens up the paint's pores to release iron particles and to neutralize the caustic compounds that have developed as a result of the particle. In one step, you can eliminate the cause and its effects. Put an immediate stop to paint damage before it's too late. Iron X Soap Gel is excellent on automotive paint and safely cleans clear coats. Iron X Soap Gel is highly recommended for all clear coated alloy wheels. Brake dust and road grime become baked onto wheels. Brake dust contains high levels of iron and can quickly pit clear coated wheels. Iron X Soap Gel easily removes ferrous brake dust to protect your wheels from further damage. Iron X Soap Gel can save you the cost of replacing your factory wheels! Note: Iron X Soap Gel should not be used on chrome, bare metal parts, brake calipers, wheel balancing weights, or SMART paint repairs. Mask off these areas. Avoid letting Iron X Soap Gel dry on any surface. Iron X Soap Gel is easy to use and you can see it working! Iron X Soap Gel cleans your vehicle with a rich foam. Just spray it into a wet sponge and wash your vehicle. As you wash, Iron X Soap Gel will turn purple when it comes into contact with sintered iron particles and turns the iron into a water soluble complex for easy removal. Rinse well. After using Iron X, you can polish and clay your vehicle as you normally would. Always apply a coat of wax or paint sealant after using Iron X Soap Gel. 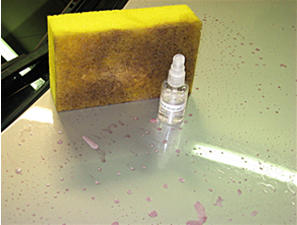 Proper vehicle care means cleaning above and below the paint's surface. Iron X Soap Gel removes iron particles and their effects and stubborn grime to keep the paint clean and healthy. 1. Rinse the vehicle well to remove dust and loose contaminants. 2. Pour Iron X Soap gel onto a wet sponge and wash the surface well. 3. While rubbing the surface, the soap gel will start to change color. Step 2 Finish Kare SIRR Steel, Iron Rust Remover/ Acid Based Cleaner 31 oz. CarPro Cquartz Ceramic Quartz Paint Protection 30 ml. This product finds the iron in the paint after claying. not as strong as the spray version, it does at good job of maintaining the paint free of ferrous dust, for wheels and a full detail, use the spray instead! Just like the previous poster I didn't see much color change. I kept going over the area several times and letting it dwell for awhile and didn't notice the color change depicted in the photos. There was rail dust left behind also. Next time I will buy the spray since it seems that works much better. Kind of dissapointed overall. Used on its own I have yet to see any 'bleeding' like the obvious 'bleeding'' action you see with Iron-X. At best the foam has turned slightly pinkish. It may be doing something I just can't see. So now I use it after the panel has been Iron-X'd. I then wash the panel with the Iron-X soap gel without rinsing the Iron-X off first. I figure the combo must be taking care of it all.